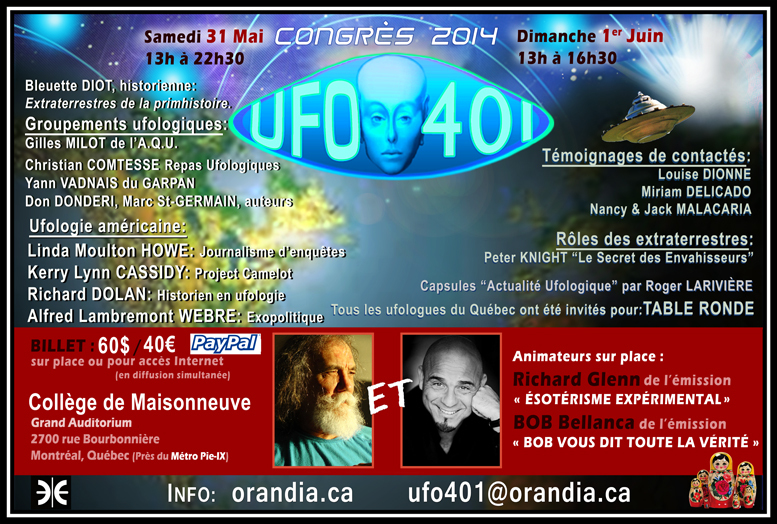 Saturday 31 more 2014, is the Congrès UFO-401 which begins at the Collège de Maisonneuve in Montreal ! The Congress will be hosted by Richard Glenn (the issuance Experimental Religion) Bob Bellanca et (animateur radio français : Bob told you the whole truth). Alfred Lambremont Webre, Author and activist lawyer for global peace and Space. – Futurological the convergence and the concept of "civilization broke away"
A booth will be set up to provide information on the GARPAN, gather evidence and meet some members of the group. 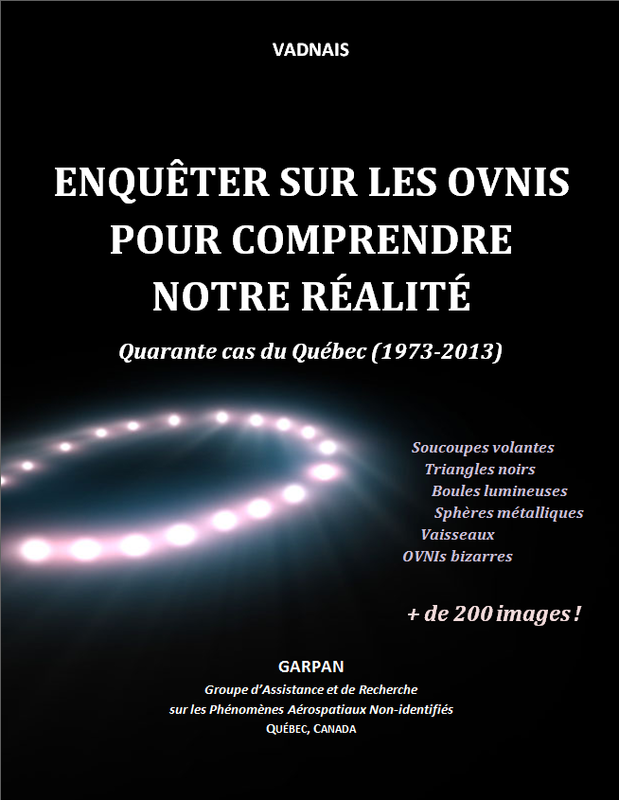 The new book GARPAN "Investigating UFOs to understand our reality, Forty cases of Quebec (1973-2013) » will be available on site ! There are investigations Maxime Boucher, Audrey Matton et Patrice Ratia. Hope to meet you at this unique and long-awaited congress in Quebec ! The GARPAN published his first book : 40 For Quebec, of 1973 to 2013 ! And many of the same, also in the 18th district. I am in 6 th floor with views to the north (including off the ae9roport Bourget). I saw this morning 4:00 a bright green light sperhe with a rather blue halot fall’ e0 25b0 to the ground before cache9 not be by the chimney of the building across the street. There was no traine9 behind, no noise, time without any clouds, wind in the opposite direction of the fall of the object (fume9e of fireplaces). It e9tait or a plane, or a he9licoptere, or fireworks, ni une pivot the détresse . In short I do not know what it e9tait.Temps observation: just over one second (So very fast). +8Was this answer helpful? Next story UFO filmed at the output of 401 UFO-Congress ?